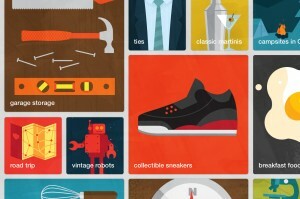 Pinterest has announced that 2014 will be a year of great expansion. The famous social network is making improvements to the web searching system it has now announced a new tool called Interests. The new tool can further refine search results and get pins more closely related to our expectations based on the pins that have previously selected. For example, if we look for ideas to make a wooden shelf, now we have to enter in the ” DIY & Crafts”, where we find the shelves among a multitude of projects ranging from carpentry to crochet and sewing (for instance). This will stop being a problem soon because with the new “Interest” tool , the projects that features a similar characteristics will be displayed in a new “sub- category” called, for example, DIY furniture. That would provide limited searching results and we could easily find pins much closer to our tastes and preferences. 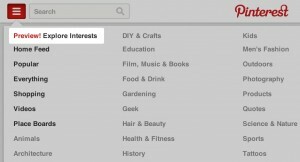 Currently it is not available for everyone yet, but Pinterest is working on it. By the moment, in some countries users can give it a try as a “preview” feature on your desktop browser. The company has announced the plans to expand this tool soon to all countries and also extend it to mobile devices apps. Many users expect that this tool can replace “related pins” a current tool which tries to provide potentially interesting results for us. However, “related pins” has not obtained the results that could be expected from such a tool. This improvement was announced just a week after the company includes an interesting way to search for recipes. Now, when we look for a recipe, we can search by ingredients and filter results by vegetarian, vegan or gluten-free, for example. You can find more details about this interesting new tool in the Pinterest blog.